Carles Puyol's match-winning header against Germany in Wednesday's World Cup semi-final was the fruit of a move worked out on the training ground at Barcelona, the defender said on Thursday. Puyol soared above the German defence in the 73rd minute to meet a corner from Barca teammate Xavi and powered the ball into the net to send the European champions through to their first final, where they will face Netherlands on Sunday. "It's a move that we do at Barcelona," the shaggy-haired centre back was quoted as saying in As sports daily (www.as.com), adding that the goal was similar to one he scored against Real Madrid in a 6-2 victory for Barca at the Bernabeu during the 2008/09 season. "We mentioned it to (coach Vicente) del Bosque a couple of days before the match when he told us that they (the Germans) were playing a zonal marking system and I said it might work out well," the 32-year-old said. At a packed news conference at Spain's training base in Potchefstroom later on Thursday, he added: "I told Xavi at halftime to put it around that area and he did it very well and it all went off perfectly." Del Bosque said in a internet chat on the website of daily El Pais (www.elpais.com) the Spanish players had been practising both short corners and balls into the penalty area like the one that Puyol converted. "It's true that at Barcelona they do that when their opponents are defending in zones," he said. "We had discussed it with Carles." 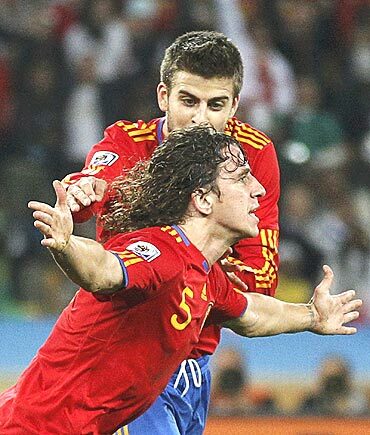 It was Puyol's third goal for Spain in his 89th appearance and he told Thursday's news conference it was important to make the most of the moment, especially for players who rarely got their names on the scoresheet. "I don't think I'll go down in history for that one," he said. "I know very well what my status is. I hope there will be a goal just as important on Sunday." The match against the Germans, who had thumped England and Argentina 4-1 and 4-0 respectively in their previous two matches in South Africa, had been Spain's best performance of the tournament, Puyol said. "We were solid at the back and we have a great forward line but maybe we were lacking that second goal to settle us down a bit and stop us suffering right until the end."